Research in the field of vocational education has shown, without question, that there is a direct correlation between the amount of time spent training in a formal educational situation and the level of success achieved by the individual trainee. More education = More success. 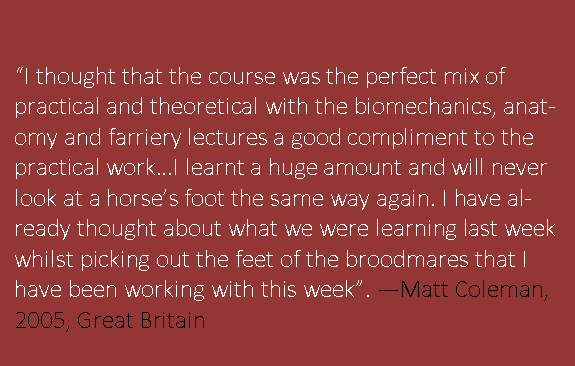 The feedback we have received from former students, horse owners and practicing professional farriers, supports that notion. 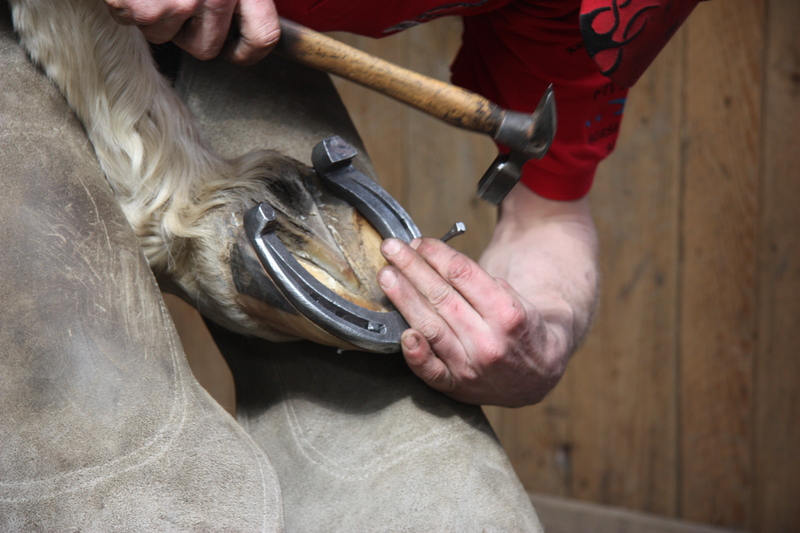 Therefore, we have developed what we feel is the premier farrier training course available in America. This course includes classroom theory, hands-on practical training, work-study and a structured internship program which, combined, give the student the maximum chance for success as an entry-level farrier. 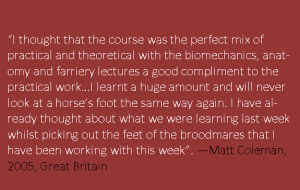 This professional farrier course is a performance based curriculum designed for those students with high expectations. 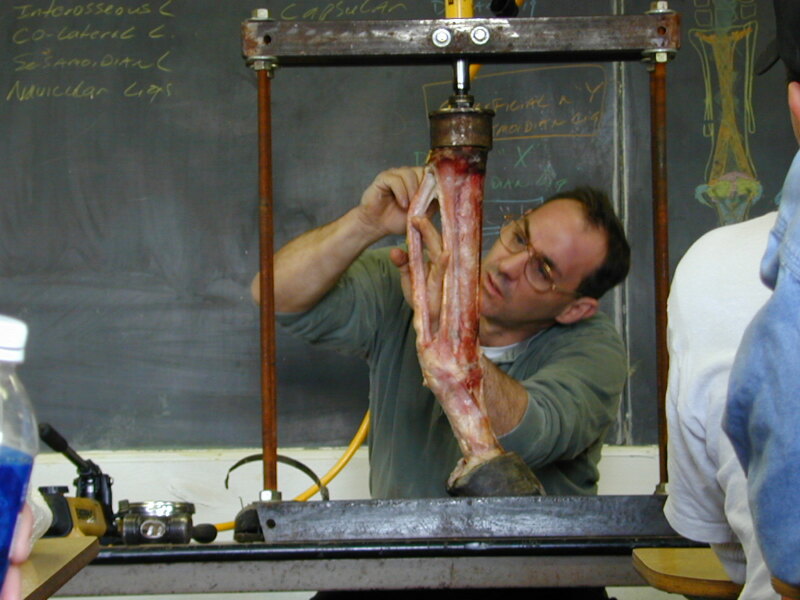 In addition to mastering the skills in the 12 and 24 Week Course, the 36 Week student will gain an understanding of advanced anatomy, biomechanics, lameness, and pathology, modern materials (use of adhesives, urethanes, non-ferris shoe appliances, gas welding and brazing, mig welding, and tool making), personal health strategies, advanced business strategies, critical thinking strategies, farrier/vet relations, public speaking, and breed and sport specific shoeing techniques. During this course you will also learn how to interpret radiographs and to communicate with owners and veterinarians in a professional manner while formulating your treatment strategies. In this process you will learn communication and business skills that are critical to your business success. This course covers classroom instruction plus lab and workshop instruction. Students who achieve a rank of High Distinction in this class will be invited to enter our National Farrier Training Program (NFTP). 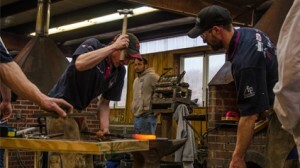 The NFTP adds a structured, paid apprenticeship (internship) coordinated with an American Farriers Association Certified Journeyman Farrier. Please see “National Farrier Training Program” on this website. The NFTP is unlike any other program of it’s kind available today, and what we consider the fastest path to assured success. Students in this course are responsible for assigned readings and homework. If possible, it is suggested that each student bring their own laptop or comparable computer as some homework will be required using a computer. Cadaver leg trimming 14 hrs. Live horse trimming 370 hrs. 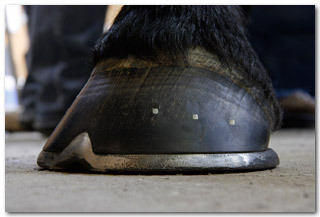 Shoeing Feet & Horses 381 hrs. TOTAL CLOCK HOURS 1440 hrs.